Mike and Mike really did it! They drove 3,800 miles across the country in six days. Medford, Mass., to Bellingham, Wash., fueled only by granola bars, candy, water, Pepsi, ... the usual bachelor/camping food. 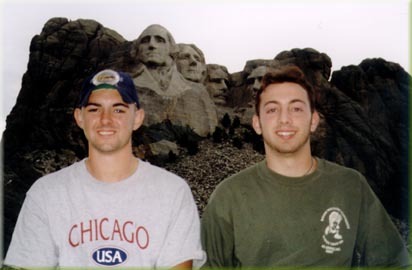 One of our first stops was Cleveland. 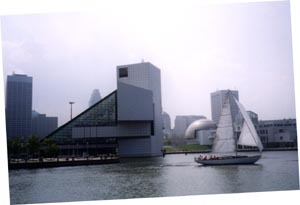 Here's the waterfront, with the Rock 'N Roll Hall of Fame on the left. 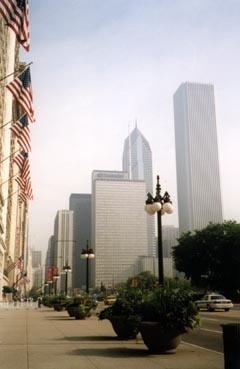 Then we got to Chicago. We checked into the Westin O'Hare and rode the train to downtown. 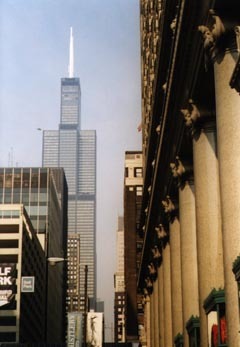 Then we took a two-hour bus tour to see downtown, the North side and, of course, the Sears Tower. The view from up there was awesome, even though there was poor visibility. Driving, driving, driving, driving ... about 800 miles a day. "Hey, Mike, what road are we on?" "You call this a road?" There are more pictures of the road trip to be posted soon.